Lisa O. Monaco assumed her duties as Assistant to the President for Homeland Security and Counterterrorism on March 8, 2013. As the President’s Homeland Security and Counterterrorism Advisor, she is responsible for advising the President on all aspects of counterterrorism policy and strategy and coordinating homeland security-related activities throughout the Executive Branch. She chairs meetings of the Cabinet-level Homeland Security Principals Committee, which advises the President on homeland security policy issues and crises. Ms. Monaco is responsible for policy coordination and crisis management on issues ranging from terrorist attacks at home and abroad to cybersecurity and natural disasters. Prior to the White House, Ms. Monaco spent 15 years at the Department of Justice, the majority of that time serving as a career federal prosecutor, and in senior management positions in the Justice Department and the FBI. She has extensive experience at the senior most levels of law enforcement and the Justice Department. She served for three years as counsel to and then Chief of Staff at the FBI, helping then Director Robert S. Mueller, III, transform the FBI after 9/11 into a national security organization focused on preventing terrorist attacks on the United States. In 2009, she returned to the Department of Justice to serve in the senior leadership of the Deputy Attorney General’s office, responsible for management of the Justice Department and its more than 100,000 employees. She served as Principal Associate Deputy Attorney General, the Deputy Attorney General’s primary advisor on criminal policy, law enforcement, national security and civil litigation matters. In that role she was responsible for assisting the Attorney General and Deputy Attorney General in overall management and supervision of the Department and its components, including the nation’s 94 United States Attorney Offices. In 2011, she was nominated by the President and confirmed by the United States Senate to serve as Assistant Attorney General for National Security, the first woman to serve in that position. In this role, she led the Justice Department’s National Security Division (NSD) which was created after the attacks of September 11, 2001, in order to integrate intelligence and law enforcement functions across the Justice Department. At NSD, she oversaw all federal terrorism and national security prosecutions nationwide and led a division of more than 350 lawyers and professional staff. Ms. Monaco made investigating and prosecuting national security cyber threats a top priority during her tenure and under her leadership, a nationwide network of national security cyber prosecutors was created. Ms. Monaco began her legal career as a law clerk to the Honorable Jane R. Roth on the United States Court of Appeals for the Third Circuit. She later served as Counsel to the Attorney General and then as a Federal prosecutor. She served for six years as an Assistant United States Attorney in the U.S. Attorney’s Office for the District of Columbia prosecuting a range of crimes from violent crime to fraud and public corruption cases. Her career as a Federal prosecutor includes service on the Enron Task Force, a group of federal prosecutors drawn from around the country to investigate and prosecute the fraud at the Enron Corporation. Ms. Monaco is a recipient of the Attorney General’s Award for Exceptional Service, the Justice Department’s highest award, for her work on the Enron Task Force, as well as the Edmund J. Randolph Award, which is awarded by the Attorney General in recognition of outstanding contributions to the accomplishment of the Department of Justice’s mission. She is a graduate of Harvard University and the University of Chicago Law School. Today, we are pleased to release the final Data Security Policy Principles and Framework (Security Framework) for President Obama’s Precision Medicine Initiative (PMI). Learn About How the Administration is Building on Past Successes and Driving Further Improvements in Our Nation’s Cybersecurity. The President's Advisor on Counterterrorism shares an update on our campaign to keep Americans safe. 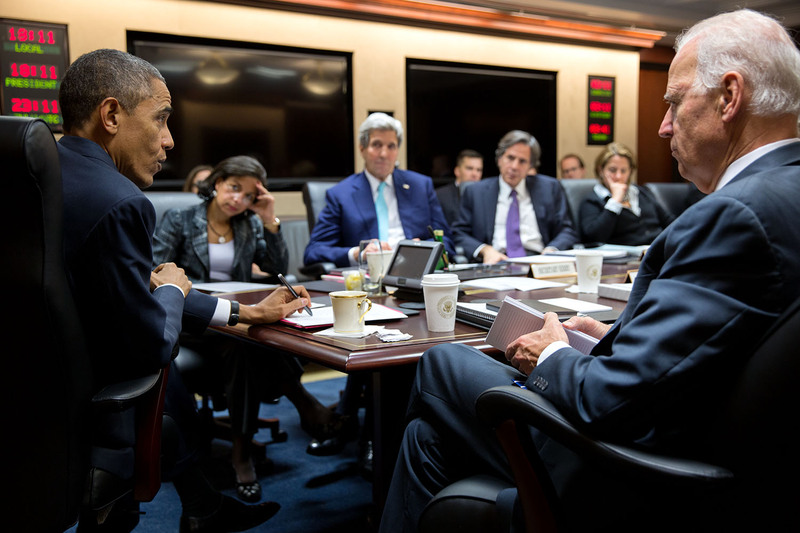 A progress update on our fight against ISIL in the wake of the recent attacks in Paris. Administration releases joint memo to agencies, plans for enhancing biosafety and biosecurity at infectious disease laboratories.